While we're waiting for the 2012 presidential election let's take a look at some of the previous races to the White House. This month's resident loser is Samual Tilden. The year is 1876. These elections were a mess. And when I say mess I mean a big big mess. Rutherford Hayes (Republican) competed against Samuel Tilden (Democratic). After the scandals and fraudulent activities associated with the administration of the incumbent Republican President Ulysses S. Grant it was clear a Democrat would be next President. 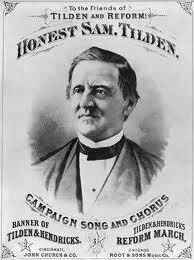 Samuel Tilden did indeed win the popular vote (51% against 48%). He also had more votes in the Electoral College (184 against 165). But there were also still twenty disputable electoral votes left over. This was the result of all kind of tricks pulled to change the results after election day. Some states claimed the Republican candidate had won while the popular vote pointed out otherwise, and vice versa. Justice David Davis, who was widely regarded as the most trusted independent in the nation. In the end a 15-member Electoral Commission was created. The Senate, the House Of Representatives and the Supreme Court each appointed 5 members. This resulted in the Commission consisting of 7 Republicans, 7 Democrats and 1 neutral member, Justice David Davis. So the position of David Davis would be decisive. Then the Democrats in Illinois though they had clever idea. They tried to secure Davis' vote by electing him to the Senate. But to their surprise Davis resigned as a Justice in order to fill his Senate seat. He thereby lost his position in the Commission. 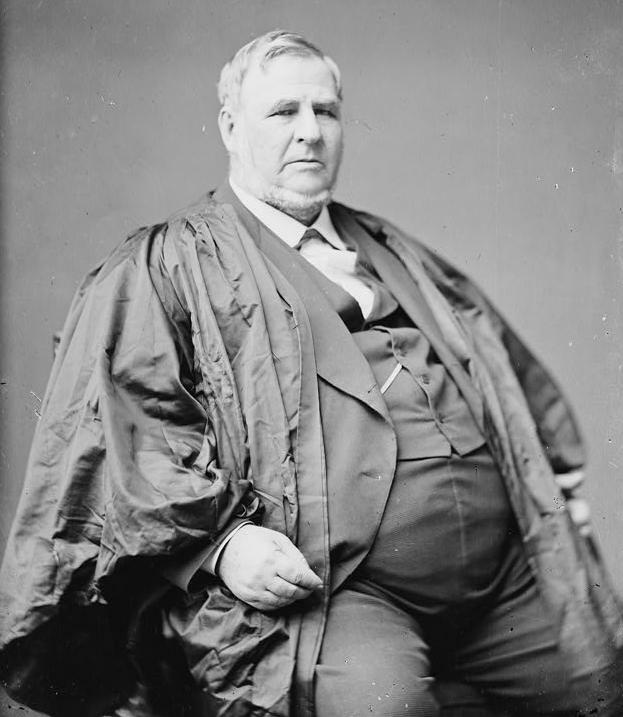 Since all the remaining available Justices were Republican Davis was replaced by a Republican in the Commission. For the 20 disputed votes the Commission decided (each with an 8-7 majority) to reward them to Hayes, resulting in a 185-184 victory and making him the next President. The Democratic-controlled House Of Representatives was very dismayed with the election of 'Rutherfraud' Hayes and even passed a resolution declaring that Tilden had been 'duly elected President of the United States'. Nevertheless Hayes was sworn in two days later. Tilden responded with "I can retire to public life with the consciousness that I shall receive from posterity the credit of having been elected to the highest position in the gift of the people, without any of the cares and responsibilities of the office." This was the only election in which a candidate received an absolute majority of the popular vote (more than 50%) without being elected President. If in South Carolina 445 voters (from the 182.683) would have voted for Tilden instead of Hayes the latter would have lost the election (source). That’s an interesting bit of history I knew nothing about. Mr Davis looks as though he enjoyed good living; you wouldn’t want to argue with him! Yes, he carried a lot of weight. From what I've read about him he seems to have been a good man. Although Al Gore received about 500.000 more popular votes than George Bush, he didn't receive more than 50% of the overall popular votes. Thank you for the compliment, Gio! These kind of tricks (together with the fact that the winners gain more in % than the losers, the fact that even if - for instance - people who vote are 65% the deputees elected are 100% etc.) are bringing my mind to believe that Monarchy is generally better than Republic. At least, not changing the Presidents' portraits as frequently as Kings' ones, it is for sure more cheap for citizens. You think a monarchy is cheap haha. This month, in the midst of a hugh financial and political crisis, the Dutch crown prince bought a villa in Greece for 4.5 million euros. Although that's better than the shooting of elephants by the king of Spain with his mistress last week. Republicans controlled the electoral commissions in some of the contested states, so it was only through the collusion of multiple levels of fraud that the Republicans were able to pull off this "win." Even at that, but for one vote, they almost failed. I don't recall seeing a photo of Davis before now. Thanks. He makes quite an impression!